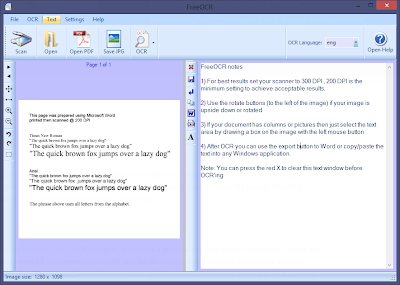 Free OCR Fine Reader Alternative : Softi Free OCR is a complete scan and OCR (Optical Character Recognition) that let you convert scanned documents into editable text with. Free OCR is powered by the Windows compiled Tesseract free OCR engine V2.00. Free OCR includes a Windows installer and is very simple to use. Free OCR supports multi-page tiff's, fax documents as well as most image types including compressed Tiff's which the Tesseract engine on its own cannot read. Free OCR now has Twain scanning included and support for multi page Tiff documents. Best of all Free OCR is totally free!